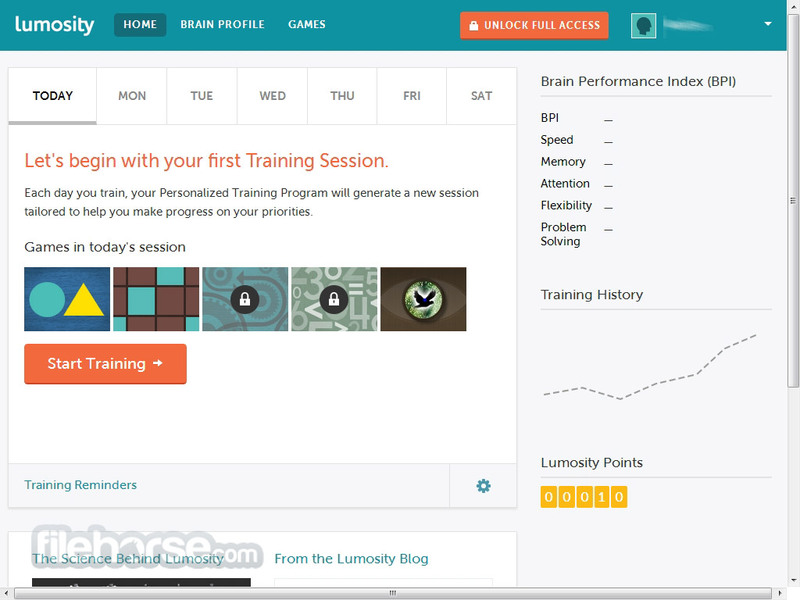 Lumosity is popular online brain training and neuroscience research company that offers everyone ability to increase their brain potential for memory, attention, speed of processing, flexibility and problem solving via entering into a online course that consists of 39 easy to understand games. During the program users will test capabilities of their brain, and constantly monitoring cloud-based algorithms will track your progress and create personalized training program that will enable easier awakening of your maximum potentials. All Lumosity’s courses and tracking algorithms are created by the leading neuroscientists and researchers who have spent their careers examining the how our brain, memory, thought and learning works. 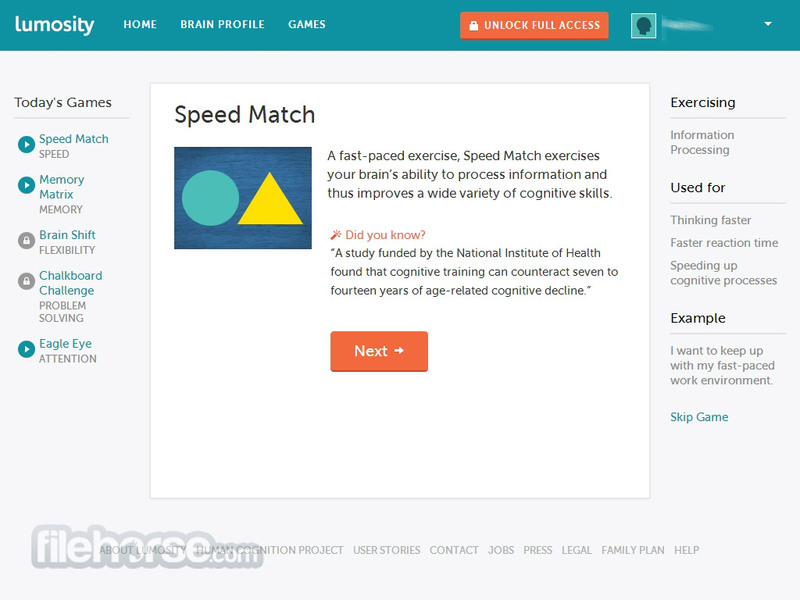 Lumosity exercises are designed by neuroscientists to improve core cognitive functions. Researchers have measured improvements in working memory and attention after training. Dozens of research collaborators help us to improve the Lumosity training program and its effectiveness. Expand abilities of your brain with fun exercises! Brain is the engine that drives us, and to make it run better we need to challenge it every day with new situations that will make us wonder and make us think. As all leading neuroscientist say, healthy brain is brain that is constantly simulated and tested, and if you feel that your mental capacity or cognitive capability is stagnating, you definitely need to start thinking about taking advantage of some of the numerous online services for testing and expanding capabilities of our brain. One of the best of those services is Lumosity, great brain games training and neuroscience research company that opened its doors in 2007. Immediatelyafter that, Lumositymanaged to become one of the leaders in the sphere of online brain training, servicing millions of users from all four corners of the world. 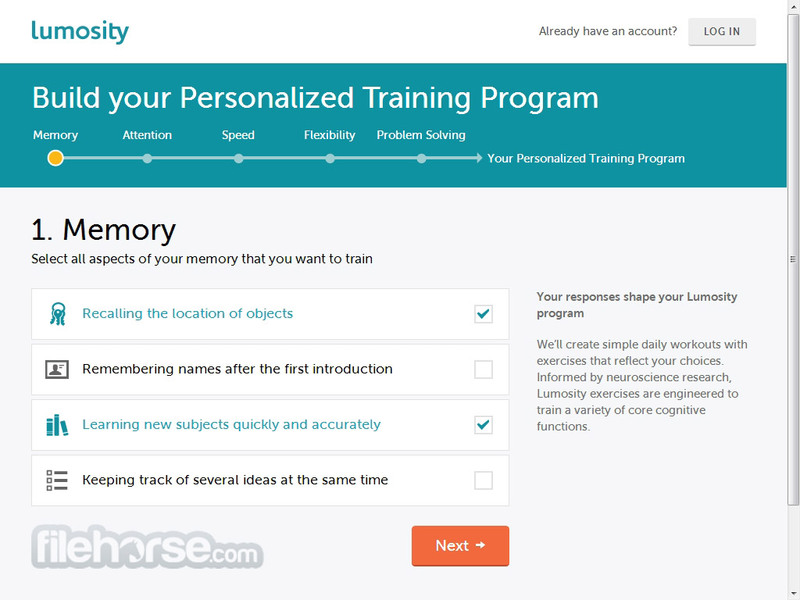 Lumosity is one of the most popular online services that enable anyone to easily assess their cognitive and brain capabilities, and test themselves in the array of scientifically designed training excercizes that will enable you to enhance your memory, reaction speed, problem solving capability, flexibility and attention. The entire process of testing and training is crated using intuitive and fun online games that will make any user at ease, and challenge him just enough so that he is interested and willing to return to go through entire testing period. These games are created by the coordinated efforts of top neuropsychological researchers from 36 international universities who have joined together to create “Human Cognition Project”. No matter if you are young or old, if you are in schoolr or you want to prepare yourself for daily life or work challenges, Lumosity has a training schedule that will fit your needs. This schedule is crafted individually for each user, enabling him to easily see the limits of their cognitive abilities and track their improvements over weeks and months. As of early 2014, Lumosity has managed to attract attention of over 50 million members from over 182 countries of the world, who all took advantage from this incredible set of brain training tools. In addition to web interface that can be access form any internet-connected PC or Mac, Lumosity also offers a standalone iPhone app that has proved to be very successful in the educational-gaming category. Lumosity has a very modern and eye-catching interface, with dead simple navigational tools and user dashboard where anyone can easily follow their progress since they have started the training schedule. Training is modular, customized by each individual user to fit their needs. Exercises are placed in 5 categories (Memory, Attention, Speed, Flexibility and Problem Solving), with users being able to pick and choose them at will. Each exercise has a simple interface, suited for users of all ages. Lumosity is a completely free service that can be used by anyone without limitations. The only prerequisite is that you need to create a new user account. This can be made in seconds, either manually or by using your Facebook credentials. New profile can be made either by clicking Start Training button on main page, and finishing selection of your training exercises. If you want to prepare your brain for all daily challenges, school, work and more, you owe it to yourself to visit Lumosity and spend few minutes each day reinforcing your cognitive abilities. Great games for our brain!